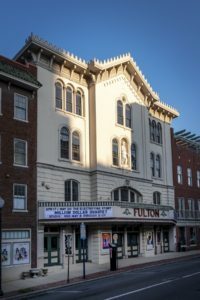 Like the proverbial cat with nine lives, the current day Fulton Theatre has enjoyed nine or more incarnations over its 166-year history. By this point in our series, it should come as no surprise that C. Emlen Urban was among the notable architects who left their mark on one of our city’s most recognizable landmarks. Designed in 1852 by Philadelphia architect Samuel Sloan as the Fulton Hall, the popular Italianate style venue offered the traditional fare of the time including musical entertainment, lectures, church fairs, celebrations, balls, exhibitions, graduation exercises, political meetings and county conventions. 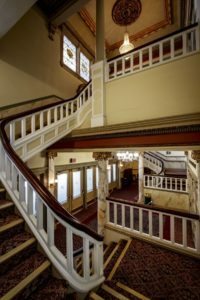 Within only 21 years of its debut, Fulton Hall was ready for a make-over, this time at the hands of one of our country’s most accomplished theatre designers, Philadelphia architect Edwin Forrest Durang. His interiors represented the best of Victorian high design complete with carpet, upholstered seats, gas sconces and chandeliers. Urban’s plans called for the removal of the entire 1873 interior with the exception of the four walls and the main balcony. The stage was enlarged, the auditorium expanded, box seats added, an upper gallery was introduced, the ceiling raised, fireproofing added, exit stairs improved and the restrooms were expanded. Other design interventions by Urban included the introduction of smoking rooms and the grand staircase, a larger lobby space, marble walls, ornate plaster molding and new lighting throughout. Although there have been other updates since that time, the stunning neo-classical interior that we all enjoy today is essentially the gift and talent of Urban. As anyone who has ever enjoyed a performance at the Fulton Theatre can attest, he deserves a standing ovation! The full LNP article is on LancasterOnline.com: Architect’s Work Earns a Standing Ovation at Fulton Theatre. Posted on May 16, 2018 by rlps.